Man, today flew by! 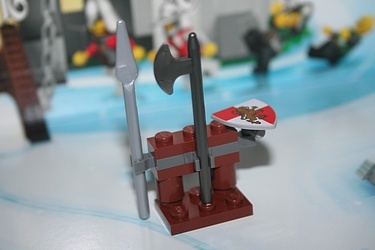 I had meant to talk about the next entry in the excellent Lego advent calendar, so let's take a quick look at what day 3 of December 2010 held for us - a weapons rack! I suppose it's because I've been working on the MOTUC content recently, but I can't help but immediately picture the upcoming He-Man weapons rack, though in Lego scale of course this is as, if not more, awesome! So far, then, we have a Blacksmith and his forge, and the product of his labor if the royal weaponry room. The kingdoms set is getting off to a fantastic start! Deck the halls indeed!